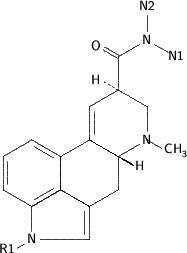 There are three main classes of ergoline derivatives, the water-soluble amides of lysergic acid, the water-insoluble ergopeptide alkaloids, and the clavine group. These compounds have a tripeptide structure attached to the basic ergoline ring, in the same location as the amide group of the lysergic acid derivatives. Some of the important ergopeptides are summarized below. 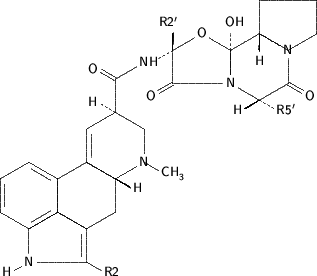 In addition to the following ergopeptides, a commonly encountered term is ergotoxine, which refers to a mixture of equal proportions of ergocristine, ergocornine and ergocryptine.